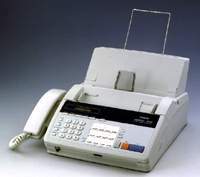 The IntelliFAX-1270 is a full featured plain paper Fax with a 20-page automatic document feed, 14.4 Modem, 200-sheet paper cassette, 450-page print cartridge and Quick Scan memory transmission. Its 25 page memory, broadcasting and convenience copying features make it well suited to handle demanding business applications. This full featured fax is both Caller ID and Distinctive Ring Detection ready for customers subscribing to these services.